want to dispel an urban legend about chewing gum: if you swallow a wad of gum, it does not sit in your stomach for seven years. In most cases, actually, not even seven days. Chewing gum, although not meant to be swallowed, passes harmlessly through the digestive system and is excreted in the same manner as everything else we eat. What Risks are Associated with Swallowing Gum? Simply put, an individual must swallow multiple pieces of gum in a very short period of time or swallow one great big wad of chewing gum to create a potential digestive risk. 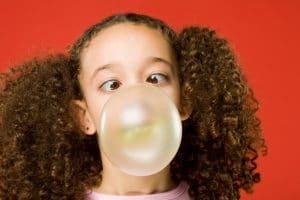 At one time or another, every kid puts five or six pieces of gum in their mouth to achieve an ultra-dense, cheek-bulging wad, especially with bubble gum if they want to blow big bubbles. If they swallowed that particular wad of gum, well, that could pose a problem. The truth, however, is the occasional swallowed piece of chewing gum is going to have no effect on the body. Now that we have established the truth about swallowing gum, let’s talk a little about what kind of gum is right for your kids. Is gum really bad for a child’s teeth? Does chewing sugary gum lead directly to cavities? This depends a lot on the volume of gum and the brushing habits of the child. What Does Chewing Gum Do to Teeth? What happens when we chew gum is the sugars are broken down by the saliva and absorbed or swallowed. What are left on the teeth are acidic byproducts—these eat away at tooth enamel and create cavities. We want to assure you that chewing gum will not have much effect on overall dental health as long as the chewer practices good oral hygiene and brushes at least twice a day. Chewing several pieces of sugary gum every day without brushing properly will certainly accelerate tooth decay and cause cavities. However, from an orthodontic point of view, chewing gum can damage the brackets and wires we place to move your teeth during treatment which is why we ask our patients not to chew gum while wearing braces. So if your kids aren’t wearing braces, does that mean you should only allow them to chew sugar-free gum? This is where the debate gets personal. Some health professionals suggest sugar-free gum is not any healthier than regular gum because of its synthetic sweeteners. The Internet is flooded with literature about aspartame (the chemical sweetener used in NutraSweet and Equal), saccharine (Sweet’N’Low, Carefree gum), and also sucralose (the artificial sweetener in Splenda). Study the facts and decide for yourself what is best for you and your family.